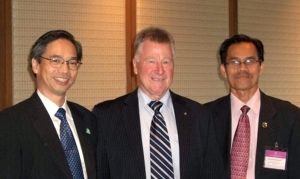 At the ITS Asia Pacific Forum in Kuala Lumpur, Malaysia were (left to right) Secretary General of ITS Asia Pacific Hajime Amano, ITS Australia President Brian Negus, and ITS Malaysia President Dato Mohammed bin Husin. They were pictured following the ITS Asia Pacific Board vote recommending ITS Australia to host the 23rd World Congress on Intelligent Transport Systems in 2016 in Melbourne. Directors of the Intelligent Transport Systems Asia Pacific Board, meeting at the ITS Asia Pacific Forum now on in Kuala Lumpur, Malaysia, have recommended Intelligent Transport Systems Australia (ITS Australia) host the 23rd World Congress on Intelligent Transport Systems in 2016 in Melbourne. This decision is to be officially approved at the ITS World Congress Board of Directors meeting to be held in Tokyo on 9 May 2012. The World Congress will bring 6,000 to 8,000 ITS professionals to Melbourne from all parts of the world, making it one of the largest congresses to be hosted by the city in 2016.